William Smith, known in his day as “Strata Smith”, was a civil engineer and geologist. The “Father of English Geology”, he was responsible for initiating the production of the first geological map of England and Wales. 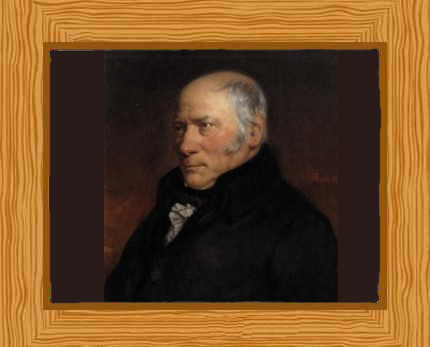 Born in March 23, 1769 at The Forge in Churchill, Oxfordshire, England, William Smith was the eldest son of John Smith, the village blacksmith, and Ann Smith. His father died when he was only seven years old eight and was then raised by his uncle, who was a farmer. As a child, William became interested in the local fossils and began collecting them. He attended the village school until around 1780 and later self-taught himself the basic methods of surveying. In 1787, Smith trained under Edward Webb, a master land surveyor and learned how to measure and value land. As Edward Webb’s assistant, William Smith surveyed estates in Somerset. He then obtained a position surveying routes for a planned coal canal from Somerset to London in 1794. His work included a fact finding expedition of the canals in the midlands and northern England. The canal excavation began in 1795 and Smith discovered that the strata (different sedimentary rock layers) of Somerset could be mapped and he observed that that the same types of fossils appeared in the same strata. He also noticed that the strata of Somerset extended northwards across England. Smith realized that he could chart the strata on maps using colors to indicate the different strata and their thickness. In 1799 Smith was dismissed from his position over an engineering disagreement and he set up in partnership with Jerimiah Cruise as a land surveyor in Bath. Realizing that there were economic gains in finding strata with coal iron or clay, Smith travelled England finding commissions to survey land. His work included coal prospecting, building sea defenses, improving harbors and canal surveying. He continued collating information concerning the strata of England, spending his spare time travelling the country filling in any missing caps in his geology map of the country; but he struggled to find a publisher. Proud of his finds, Smith displayed his fossil collections in Bath from 1802 to 1805. Smith found the time to publish “Water Meadows” in 1806 an account of the successful drainage of the Prisley Bog he worked on in 1802 and 1803. In 1807 the Geological Society of London was founded but they did not consider publishing Smith’s map. He married Mary Ann in 1808 and they had no children. After many tribulations and with the support of Sir Joseph Banks, in August 1815 his “Geological Map” of England was finally published. Titled “A Delineation of the Strata of England and Wales, with Part of Scotland”, this was an amazing work for one person, although it was not a commercial success. The map comprised fifteen sheets all in all, on a five miles to one inch scale. The Map measured (when joined) 259cm x 176cm and could be purchased in a variety of formats. Over the next four years of its publication, Smith constantly updated the work as his geological knowledge increased. He went on to produce an excellent set of twenty one large scale geological county maps from 1819 to 1824. Financial hardship in 1819 led to him spending almost ten weeks in a debtor’s prison and he was obliged to sell his extensive fossil collection and library to help remedy the situation. In 1820, Smith began working with his nephew, John Phillips, and he also lectured in Yorkshire. He became land steward to Sir John Johnstone in 1828 and produced a detailed geological map of his employer’s Hackness estate in Yorkshire in 1832. The same year he was also granted a government pension of £100 per year. It was not until 1831 that Smith was finally formally acknowledged as a vital part in the advancement of geology. He was given the first ever Wollaston Medal, an honor presented by the Geological Society of London to those who have shown great contributions to geology. Smith moved to Scarborough in Yorkshire in 1834 where he helped found a geological museum “The Rotunda”. The museum focused mainly on the geology of the Yorkshire Coast. As a tribute in his honor, it was renamed “Rotunda: The William Smith Museum of Geology” in May 2008. He received an honorary LLD degree from Trinity College, Dublin in 1835. He was also among the group of commissioners who were given the privilege of choosing the building stones for the Houses of Parliament in 1838. William Smith caught a sudden chill and a few days later died on August 28, 1839, aged 70, at the house of George Baker in Gold Street in Northampton. His remains were buried in St. Peter’s Church, Northampton. John Phillips, his nephew who also trained under him, edited his memoirs which were published in 1844. Phillips later on became a notable figure in geology and paleontology during the 19th century.